Nick with his wife, Kati, and their son, Osric. Nick, age 33, is a music teacher with close to a decade of experience teaching in Connecticut public schools. He moved to New Britain in 2006, where he met his wife, Kati. Kati, a Civil Engineer and published author, bought a home and moved to New Britain in 2005. They fell in love with the community and have lived in New Britain ever since. In 2009 they were blessed with their first child, Osric, and they look forward to raising him in New Britain and sending him to the public schools. To give back to his community, Nick has worked on projects such as the Rose Garden and town-wide cleanup drives. Nick has also been involved with local politics, having served on the Board of Finance and Taxation under Mayor Tim Stewart. While on the Board of Finance and Taxation, Nick began to question the policy decisions of then Superintendent Doris Kurtz. While advocating for increased funding for our schools he was also outspoken about the need for reform and to change how money was being spent. 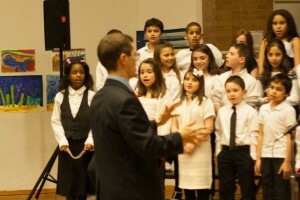 Nick, conducting a choir of 3rd and 4th grade students. Nick pushed for a more transparent and open budget process from the Board of Education. He was concerned about issues ranging from how money being wasted on the city’s bloated bussing program to inequities in how arts education was being funded amongst different buildings. His diligence came to the attention of the Citizens’ Property Owner’s Association of New Britain, a tax payer advocacy group that is focused on fiscal responsibility and effective government. In 2012 Nick was elected president of the CPOA and has served in that capacity ever since. Over the past few years he has attempted to bring to light public policies that are harmful to the future of New Britain’s schools and the community as a whole. His focus on community led to him being asked to join the Board of the New Britain Symphony Society, where he is now serving his second year as a board member. Nick has also recently received the honor of being appointed the Eastern Division Representative for the Organization for American Kodaly Educators. This position has given him the opportunity to help shape the direction of this national teacher organization, as well as network with teachers, administrators, and policy makers across the country. Nick has a Bachelor’s degree in Music Education from the State University of New York at Potsdam and a Master’s in Music Education from the Hartt School at the University of Hartford. In addition to his degrees, Nick is also registered with the State Department of Education as a trained mentor and cooperating teacher and has experience in curriculum and assessment development. For the past two years Nick has served as the President of the Citizens’ Property Owner Association of New Britain, a property owner group that focuses on fiscal responsibility and efficient government. He has also been involved in a number of other civic functions, from participating in Clean City initiatives, serving on the Board of Finance and Taxation, to volunteering time to the New Britain Symphony Orchestra and the Rose Garden. Nick believes that New Britain has the potential to be a thriving city an enjoys giving his time to help the city toward that goal. Nick is a loving husband and devoted father. 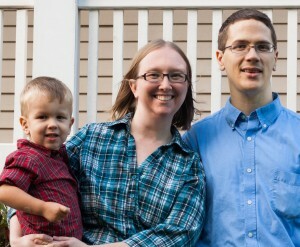 He and his wife Kati have been married for six years and have a 3-year old son Osric. Much of Nick’s free time is spent with his family with whom he enjoys kayaking, hiking, or simply spending time together. Both Nick and his wife are Connecticut natives and, as a result, are blessed to have multiple sets of grandparents who live close by.